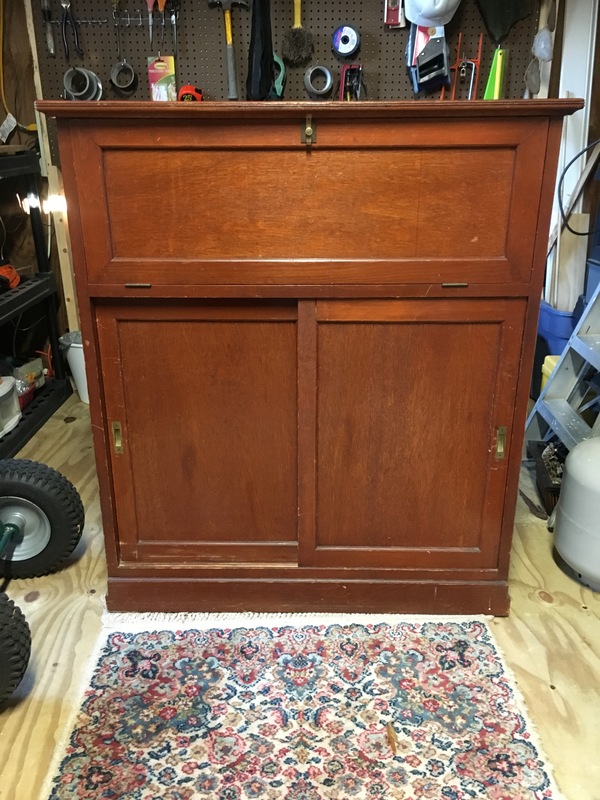 The previous owner of my home had left an old slightly rickety bar cabinet in the kitchen. At one time during its life time it was probably very nice, but it appeared to have been somewhat mended at one time and it was missing pieces inside. There is a lack of a proper cupboard in the kitchen so I gave up one of my library shelves which works perfectly for an open cupboard. The old bar cabinet was temporarily moved to the centre of the kitchen where we discovered it to be a convenient place to work from or place items from the refrigerator when foraging. I decided that would recycle the cabinet and turn it into a kitchen island. This was decided, but it sat there like it was for almost what seems to have been a year. After the winter holidays it was moved to the tool shed where I could begin work on it, which I did, but then spring arrived and my focus was back on the garden so the whole project came to an end. I am happy to report that I have finally completed the redo of the bar cabinet and it is now a very useful kitchen island. Originally I though I could shorten it a little, but as I started to take it apart I realised if I took too much off the whole cabinet would have collapsed so I decided to keep it the height it is. I added a large top and used decorative corner pieces to support of the top and support a the bottom to keep the cabinet from flipping back if you were to press down on the over hanging table top. I had to be creative with making pieces to cover the rough ends on the original parts of the cabinet, but I believe I was successful. Inside the cabinet there probably was a mirror and some kind of light, but all of this was missing. I applied a metal like contact paper on the very back and on the fold down door. This is the area you can mix drinks and the contact paper makes for easy clean up. Inside the cabinet below I added simple contact paper I already had on hand. The only thing left to do is to find a nice bar stool to go with it. Waiting to receive bottle of spirits. Ready to make you a cocktail! Beautiful job! I love it. Just gorgeous. Thank you. It has been very useful in the kitchen.